Fiji conjures up images of white sandy beaches and azure waters, a tropical paradise of cruise ships and luxurious resorts. Everyday life for the average Fijian family however is very different, with as many as a third of Fijians living in poverty. 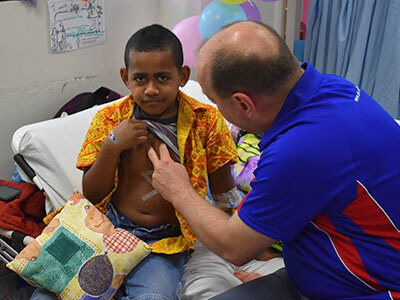 Despite Fiji being one of the more developed countries in the Pacific, health services are under-developed and cardiac surgery is unavailable. Lying northeast of New Zealand, Fiji is a vast archipelago of more than 330 islands, of which only one third are inhabited. Most of the 900,000 population live on the coast of the main island Viti Levu, either in the capital Suva or in smaller city centres. Open Heart International first visited Fiji in 1990. Since then we have made more than 25 surgical visits and performed over 800 life-changing operations. 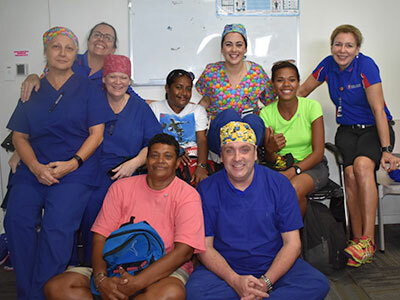 Every year we send a large team of over 40 medical volunteers to Fiji. The team arrive at the Colonial War Memorial Hospital in Suva for two weeks of intensive, rewarding work. 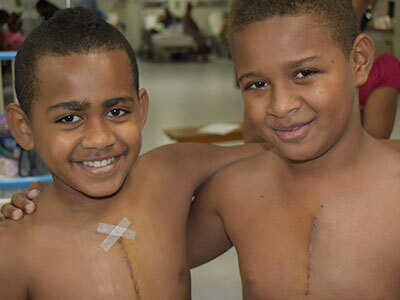 Working collaboratively with the local doctors and nurses, the team perform life-changing surgery for over 30 Fijians with every visit. Many patients are children suffering from congenital heart defects, as well as adults with complications from rheumatic heart disease. Multiple operating theatres run simultaneously, but despite the intense workload, many are still left waiting for surgery. Even in challenging working conditions, safety is always paramount, and we consistently achieve world-class surgical outcomes. Clinical education and training are also an essential part of our contribution. Our team give formal lectures and informal on-the-job training to the local medical team. This skill exchange is seen as an important way to improve health outcomes long after we have left. Our work in Fiji aims to give the local people access to life-saving surgery and reduce the heartache of chronic illness and early death. With your support, we can continue to help the people of Fiji lead long and healthy lives. Timaima is a strong and independent 27-year-old woman. She enjoys a happy, healthy life enriched with community, work, family and friends. Her future did not always look this bright. However as an infant, Timaima was small and sick. She was born premature in 1992, with a heart condition known as atrial septal defect, a hole in the wall that separates the two top chambers of the heart. Left untreated, her condition would lead to heart failure, high blood pressure in the arteries in the lungs and an early death. Her parents took her back to the hospital where they were told that sadly, the Fijian health system was unable to provide any surgery for their daughter. Her parents could expect nothing better than to watch their beloved child become weaker every day. Her parents desperately hoped for international assistance. Fortunately, the Open Heart International team arrived in time for Timaima. At the age of four she underwent life-saving heart surgery. Timaima was given back her health, her childhood and her future. 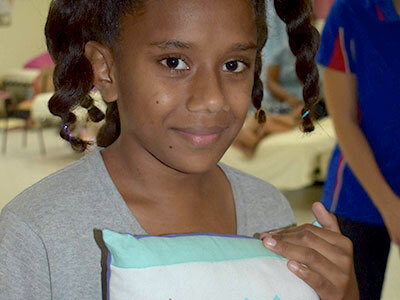 Life has played out very differently for Timaima and with your help, other sick children in Fiji can have their chance at a healthy life too.